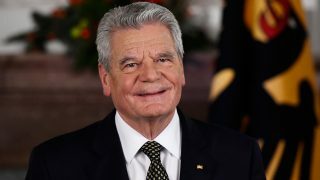 Germany's 76-year-old president Joachim Gauck will not run for a second term next year because of health concerns and his age, the Bild newspaper said on Saturday. 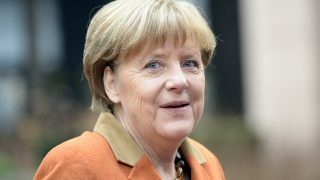 German Chancellor Angela Merkel on Thursday urged Britain to stay in the EU, warning three weeks ahead of its referendum that a 'Brexit' vote would leave the United Kingdom with less clout. 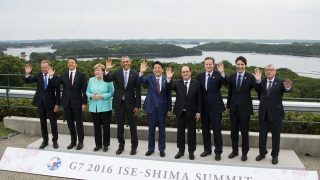 German Chancellor Angela Merkel said Thursday that the Group of Seven has no plan to withdraw sanctions slapped on Russia over its involvement in the conflict in eastern Ukraine. German Chancellor Angela Merkel on Wednesday brushed off concerns about a landmark EU-Turkey deal designed to stem the flow of migrants to Europe after critical comments by her Turkish counterpart. 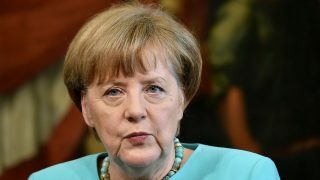 German police said Saturday they found a pig's head bearing an "insulting inscription" outside Chancellor Angela Merkel's constituency office in the country's northeast. 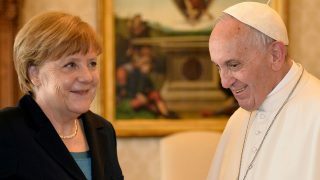 Pope Francis on Friday urged Europe to "tear down" the walls being built to keep out migrants and to create a radical new "social economy" serving the many not the few.